You can’t pick up a technical magazine, hang out on Twitter, or read an article on a technology blog without hearing the phrase: Cloud Computing. What is cloud computing? Wikipedia defines it as “Internet-based computing, whereby shared resources, software, and information are provided to computers and other devices on demand“. That definition is pretty good, but what does it actually mean? Cloud Computing provides businesses and consumers the ability to create on-demand resources and pay only for what you’re using. In the case of Amazon’s Elastic Compute Cloud (EC2) and Rackspace Cloud servers (or Instances as they call them) you can very quickly provision yourself a server, meeting your personal requirements, use it for a period of time you determine, and then remove it, drastically cutting down on the costs and complexities of building your own server or purchasing dedicated server resources. So, let’s take a look at the various areas that you as a consumer should care about, starting with one of the more important areas: Pricing. Pricing is important. You’re talking about pay-on-demand server resources, so you want them to be economical. You also want the long-term pricing model to be competitive to dedicated servers, so you don’t have to spread things between providers. 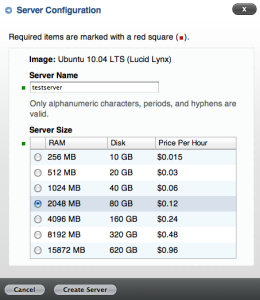 All prices are for basic Linux (Ubuntu 10.04), both services also offer Windows servers (at a higher price) and other Database options. Note: Amazon EC2 also can provide High-Memory, High-CPU, and Cluster capable Instances (not covered here). Amazon EC2 – Oddly, this is where I expected the newcomer, RackspaceCloud, to shine. Amazon’s smallest Instance, Small, is 1.7GB of RAM and 160GB of Disk, while the equivalent RackspaceCloud Instance is 2GB of RAM and 80GB of disk, but the RackspaceCloud Instance is around $26.00 more per month, for 80GB less storage. That pricing discrepancy is also just for the on-demand Instance. If you’re willing to commit to a reserved Instance at Amazon EC2, then the Amazon EC2 Instance ends up being about the same price as the low-end RackspaceCloud Instance. However, if you can get away with less RAM and Storage then RackspaceCloud does offer a 256MB Instance that’s cheaper than anything Amazon EC2 provides. The Amazon.com EC2 signup is almost non-existant, provided you’ve already purchased something from Amazon.com previously. If so, you already have your EC2 account credentials. Just head over to http://aws.amazon.com/ and click Sign Up Now. As long as your credit card information is on file, and correct, you’re done. Amazon will just drop you at your AWS Management Console. Now sit back and wait for your Welcome email from Rackspace. Oops! Wait a second, there IS NO WELCOME EMAIL, at least not yet. Rackspace requires that someone actually call you, at the number you provided, in order to confirm your billing address and the last four digits of your credit card. They claimed that you’d hear back in 15 minutes, it took them about 25 to contact me. No idea why this step is required, it seems completely arbitrary, but make sure you provide a good phone number, that you can immediately answer, or you will have to call them at the number provided. Once you’ve talked to them and confirmed your information, the elusive Welcome email is forthcoming. Of course, I had to wait another 25 minutes for mine to arrive. **Amazon EC2 **– You’ve probably already got an Amazon.com account, so there really isn’t any sign-up. Regardless, tossing me an advertisement while I’m trying to sign-up for your service is just amateur, especially one that drops in the middle of the screen blocking the fields you’re asking me to fill out, then add the fact that I’m required to actually talk to someone, FAIL. Amazon supports Fedora, Windows, and CentOS. That’s not a huge selection (no Ubuntu), but never fear. 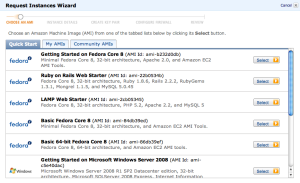 The power of the AMIs on EC2 is that you aren’t restricted to what Amazon supports as their Quick Start images. There are also Community AMIs…over 5000 of them! So, you shouldn’t have a problem finding a server that meets your needs. Once you’ve selected your AMI, you’re taken to another screen to select your Instance size (see above) and your Availability Zone. The **Availability Zones **are the different EC2 installations around the world where your server can run. You may not want all of your servers to be in the same data center. It’s up to you. However, keep in mind that servers in the same Availability Zone can pass data back and forth free of charge, and can share storage. At this point, your Instance will be provisioned and then booted for the first time. The entire process takes about 5 minutes and then you’ll be able to access your fresh, new server. Launching an Instance for the first time under Rackspace Cloud is similar to the process outlined above for Amazon EC2. 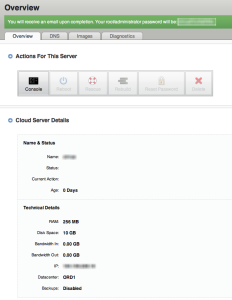 First access your Rackspace Cloud Management Interface. 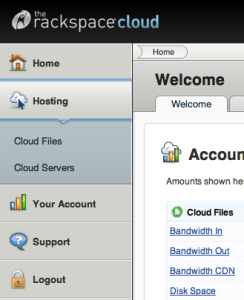 Once you’ve logged into your Rackspace Cloud account, select the Hosting button from the left-hand navigation, then select Cloud Servers. The screen now displayed will be where all of your provisioned Instances can be found. To launch a new one, click the Add Server button. You will now be presented with a list of the available Operating Systems from which you can provision your Instance. Unfortunately, there are limited choices: ArchLinux, CentOS, Debian, Fedora, GenToo, Oracle Enterprise Linux, RedHat, Ubuntu, Windows 2003, and Windows 2008. There are no Community Images supported by RackSpace, so you won’t find specialized images to use, only base Operating System loads. I selected Ubuntu 10.04 (Lucid Lynx). You’ll now be presented with a screen to select the hostname (this is a really nice feature that Amazon EC2 doesn’t provide, though you can manually alter it) and a **Server Size **(RAM), which will also determine your pricing. Once you’ve clicked the Create Server button, the instance is provisioned, assigned an IP address, and you are presented with a screen outlining your **root **account password. 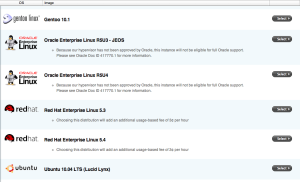 You’ve now got a running Instance under Rackspace Cloud. A Draw – Both providers do a great job of getting an Instance up and running quickly. I almost gave this one to Amazon EC2, due to the enormous number of options you have for building an Instance using AMIs, however; Rackspace Cloud has a nicer user interface and gives you some smaller options for servers, as well as the nice ability to set your hostname at boot. I had planned for the next section to be a discussion of the various ways you access your Instance. However, after my experiences with Rackspace Cloud, I felt it to be critically important to discuss the security of the two offerings before showing you how to access your servers. I’m very passionate about security. Once you have suffered a breach, virus, trojan, worm, or any other security issue, you cannot get back your sense of security. In most cases, your best option is to scrap the entire system and start over. 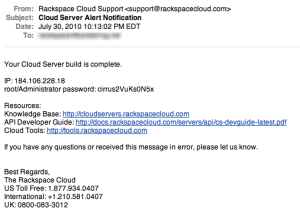 This is why I was shocked at the extremely low amount of security that Rackspace Cloud enforces. Before I get to that, I’d like to discuss the security controls that are in place at Amazon EC2. Amazon EC2, when creating your Instance, will have you configure two items as outlined above: A Key Pair and a Security Zone. Let’s take a look at each of these security measures and how to use them. Key Pair: The key pair is a requirement for building an Amazon EC2 Instance. When you’re creating your first Instance, Amazon will force you to create a Key Pair, giving it a name and then automatically downloading the Private Key to your computer. SAVE THIS IN A SECURE PLACE. This private key is downloaded to you, and IS NOT retrievable again. You will require this Private Key in order to access your Instance for the first time. Security Zone: The Security Zone is a firewall that rests ON TOP OF your Amazon EC2 Instance. It will override any and all firewall rules you later place on your Instance. I love this about Amazon’s EC2 service, because it allows me to create granular security controls on my Instances BEFORE they are exposed to the public Internet. Additionally, I can use the same Security Zone for each of my Instances, performing updates to all of them without having to revisit each one individually. When you’re creating your first Instance, Amazon will force you to create a new Security Zone, giving it a name, a description, and setting up any port controls you want beyond the defaults. The default behaviors of the Security Zone you create may depend on the type of Instance you chose to create, for this article I selected the Fedora Core 8 LAMP Web Starter Instance, which gave me a Security Zone that allowed open access via SSH, HTTP, and MySQL. However, if you wanted to tighten down any of these, you can remove them from the default provided, then re-add the protocol with more specific IP sources, all before the Instance is created. The only way you are going to be able to access your Instance, by default, is going to be by using the Private Key of the Key Pair you created. I’ll talk more about using these keys, and getting rid of these keys, below under Accessing your Instance. So, they’ve provided a would-be attacker my IP address, my Hostname (it’s part of the password, which is even worse), and the password to the root account. Everything needed to take over my Instance remotely. I can of course destroy the Instance when I find out someone has accessed it, but then I have to rebuild it myself. So, at a minimum, please immediately change your root account password the moment you log into your server, and double-check your log files to ensure no one accessed the server before you did. Better yet, secure your Instance the way Amazon EC2 is secured by default, and completely ignore the use of passwords. (Yes, I’ve destroyed the above instance, so please don’t hassle poor IP 184.106.228.18, as it’s no longer mine and you’ll get in trouble). I also cannot understand why Rackspace includes the hostname as part of the “random” password. Once you’ve included non-random components in the password, you lower the overall strength of the password, it appears pointless. Amazon EC2: No contest. I think the above speaks for itself. The most important aspect of having a server in the Cloud is accessing it. I’m going to show you how to gain access to your newly created Instance as well as some immediate security steps you should take once you’ve gained that access. You should now be logged into your Instance as root. Quick note, some of the Ubuntu AMIs on Amazon.com have the root account disabled for ssh by default (which is one of the best things about them, see below for doing this yourself), so in that case you’ll have to ssh in as ubuntu. Just replace root with ubuntu in the above ssh command. 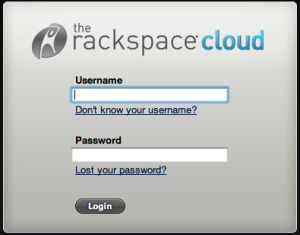 You should now be logged into your Rackspace Cloud Instance as root. You can now access your Amazon EC2 *account* using your Private Key. **A Draw**:  Both environments give you relatively easy access to the server Instance. Rackspace Cloud is super easy, just ssh there as **root** using the password they emailed you and you’re in. However, that ease of use comes at a very high price to the security of your installation, so buyer beware. I’m not going to ding Rackspace Cloud twice on security, even though I should. On the other hand, Amazon EC2 doesn’t provide **Console** access to your Instance, which can provide you emergency access if something goes wrong or you lock yourself out through a bad firewall command. **Amazon EC2**:  With three outright wins and two draws, Amazon’s Elastic Compute Cloud server Instances come out on top in my review. They provide better overall pricing, easier account signup, better Instance creation options, MUCH better security, and similar access options. Rackspace Cloud is the new kid on the block for Cloud Computing and on-demand Instances, but they need to make some major changes to their overall service if they are going to give Amazon EC2 serious competition going forward. If you liked this article, and you enjoyed reading it, please take a few moments and Digg, Tweet, Buzz, or Stumble it above to let others know about it. Additionally, if you have comments about it, just click the Comments link. I thoroughly enjoy differing opinions and discussions.